Counting milk calories? Try this experiment. 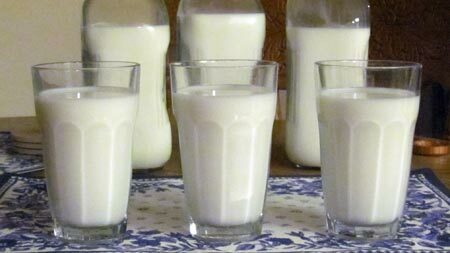 Pour a glass each of whole, 2% and 1% milk. Taste one after the other and I'll bet you have a hard time telling the difference. If you do taste a difference, it's slight. Portion reduction of milk is not recommended because the low fat version is more than acceptable taste-wise. Plus, most of us don't get enough of this important food. Vitamin D and calcium are an important part of a healthy diet plan. So don't limit portion sizes of this important beverage. Make this change everyday for a year, save a total of 32,120 calories and lose 9 pounds. And still enjoy ice cold, refreshing milk! Most reduced or no-fat dairy products, like cheese, are not acceptable substitutes for the higher fat content counterpart because they taste so bad. In those instances, it is best to reduce PORTION SIZES. However, non-fat yogurt is an exception. Taste and consistency are fine. Try it yourself, not bad.